Posted on Thu, Apr 5, 2012 : 8:34 a.m.
Usually you see lighters and cell phone lights up in the air at the end of a show beckoning an encore. EMU Convocation Center’s audience flipped it around at 20-year-old Pittsburgh rapper Mac Miller’s performance on Wednesday: A sea of sparkles flooded through the crowd as they champed at the bit in anticipation of his set. After the lights went down and before Miller came on stage, DJ Clockwork teased the crowd with the first track off the headliner’s 2011 debut studio album, "Blue Slide Park," “English Lane.” It built up the anticipation a little more before giving the kids what they really came to see. Before his appearance on stage with backup hype man Treejay, the crowd had been warmed up by the word spitter’s friends The Come Up and The Cool Kids. It took the crowd a little while to loosen up during The Come Up’s set, but they had some obvious fans. People who came ready to dance and bob their heads got to it. The Cool Kids captured more of the crowd’s attention with their set. A best guess is that a decent portion of the crowd was already a part of their fan base. Miller took the stage performing a hit "Blue Slide Park" song, “Party on 5th Ave.” and the party was on. A high-energy, excited crowd welcomed him with open hands up in the air. A majority of the males in the crowd obviously dig his style of dress. Backwards baseball caps on young, tattooed 20-something-ish guys and similarly clothed teens spanned as far as the eye could see. And that is no hipster dis. They simply seemed to genuinely relate to him. In a phone interview before the EMU show, he promised a highly visual stage show with lots of lights and video work from buddies Ian Wolfson and Rex Arrow. He lived up to his promise, “You’re going to come enter my world for a little bit.” The video, colored lights, and mushroom-shaped lanterns placed around the DJ booth were quite theatrical. Miller does not hide his naughtier exploits from his listeners. His lyrics sometimes reference things like hooking up with girls, partying, drugs, and doing other things that some parents would rather not know about. But that is not all that he is about. Many songs are quite thoughtful reflections on his success, being young, and navigating your way through the BS. The young crowd related, belting out most of the songs along with him. There really is something special about how Miller spits out his words in live performances. He can do it quickly and clearly. He exhibited both the stamina of a young guy and the ability of a more seasoned rapper. Miller did well to mix it up by doing songs from his breakthrough debut studio album with Rostrum Records, "Blue Slide Park," and plenty of hits from the mixtapes that he distributes online for free. 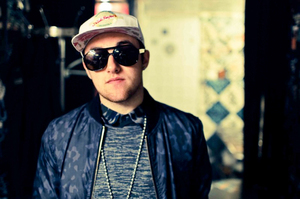 His newly released 2012 mixtape "Macadelic," which inspired the name of his current tour, was well represented with songs like “Loud,” “Thought from a Balcony,” and “Lucky A-- B----" (featuring a sample of indie pop band The Bird and the Bee’s enchanting song “Again and Again”). He also took the crowd a couple of years back in time with songs from his popular mix tapes "K.I.D.S." and "Best Day Ever." The crowd recognized “Knock Knock” and “Nikes on My Feet” from "K.I.D.S." Title track “Best Day Ever” and “All Around the World” had the crowd going just as hard. He saved one of his most popular current singles, “Frick Park Market,” for a spot near the end of his set at EMU. Performances of other songs from "Blue Slide Park" included “Loitering,” “My Team,” and “Diamonds & Gold," and others. As if the full 3-hour show were done too soon, he left the crowd wanting more with an encore performance of “Donald Trump” off "Best Day Ever." It is a song that audience member Josh Johnson, a college student from Ann Arbor, particularly enjoyed. “I found it to be an energetic, high velocity performance. Everybody was feeling it, everybody was happy. I’ve been up on Mac for some years now,” he says, adding that he was happy he hear plenty of songs from Miller’s mixtapes. Concert-goer Richard Marshbanks of Flint is fan of hip-hop and live music, but he had never heard of Miller before the show. He snagged an extra ticket to see it with a friend who was chaperoning his younger sisters. “It was cool and he was high energy. I would check him out in the future,” he says. Thu, Apr 5, 2012 : 5:19 p.m. Such an in depth review for such a nobody rapper wow! This is news? Did Mac Miller PAY someone here on A2.com to write about him? This is the 2nd article written here about some no name rapper who's talent is LIMITED at best. I have watched Mac Miller's video's and listened to his music, If that is what you want to call it. Yes, I know good music is in the ear of the beholder but Miller's music is nothing to ride home about. He is fit for small venues such as nightclubs and being hired for parties (Maybe) and that is about it. This is a waste of article space that could have been about finding a missing child or a wanted criminal. Fri, Apr 6, 2012 : 11:39 p.m. I always appreciate hearing readers' opinions, even when they differ from my own. I'll just add that Miller does have a following in the area. That is why I wrote about the show. As an entertainment writer, I don't write about missing children or crime anyway. So my writing about Mac Miller doesn't take anything away from that kind of coverage. If there is an upcoming concert you'd rather read about, feel free to suggest it. Thu, Apr 5, 2012 : 5:21 p.m.